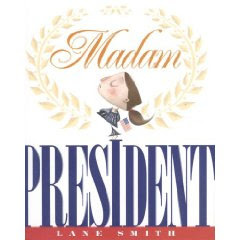 Madam President by Lane Smith. Hyperion Books, 2008. Copy supplied by publisher. Picture Book. A young girl imagines her life as President of the United States. Some of my favorite (fictional) Presidents are women. President Powers. President Roslin (OK, not President of the US. But still.) And now Katy, who not only wants to be President -- she lives her life as if she were President. She's confident. Katy explains, "A president must tackle press conferences gracefully." A blackboard says, "oral reports today," while Katy brings her own presidential podium to the front of the room as her teacher and classmates look on. Then she begins, "That's top secret. No comment. I'll get back to you on that. I won't digntify that question with a response. C'mon, Tiffany, get real! No comment. Let me think about that. I know you are, but what am I? Next question. No comment!" The font varies in size, so you can sense Katy's response. And I love the working into it of "I know you are, but what am I?" I have the most fun looking at the background details in pictures like the bedroom. It's not just about Presidents -- it's all US History. Our President is a non-fiction fan. Posters of Susan B. Anthony and Revolutionary War flags, plus a Mr. Potato Head (she sitll is a kid!) and books on Frederick Douglas, Theodore Roosevelt, and Harriet Tubman. This isn't a wordy book; but it is a picture book for older readers, who will get the references and chuckle at Madam President's press conference. This is my favorite "kids in office" picturebook--I just wrote about it in my column, in fact. I love the books and posters in her room!